DETROIT RUNNER....: Clif Bar Shot Bloks Winner!!!! Rest day today...again. Not quite ready to run yet. Probably on Thursday. Legs are sore still. It's amazing how just another 6.2 miles can make you feel after. 20 miles - no soreness; add 6.2 - Ouch! Carrie from Family Fitness Food!!!!! Congratulations Carrie! Send me an e-mail with your contact information/address and I will have the folks over at Clif Bar send you the goods. Thanks again to Clif Bar for providing this fun giveaway!!! I won!!! I won a new book that I have really been wanting to read. 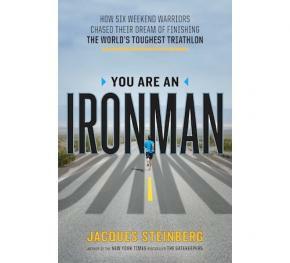 "You are an Ironman". Dax over at Dirty Running did a contest for this. Check out his great blog HERE. Thanks again Dax! I can't wait to read it! Have any of you read it yet? It seems to be making it's way around blogland. Not that I'm thinking of doing one anytime soon but I'm sure there are inspiring stories. After just running another marathon, I still cannot imagine throwing in 112 miles of biking and 2.4 miles of swimming. Crazy! Question of the day: Who's crazy enough to do an Ironman? Who's crazy enough to do an Ironman? Apparently you, now! Yay!!! Love seeing my name in lights. Love Shot Blocks, too. Thank you!!!! I'd never do an ironman. This I know for sure!! I just picked up that book at the library. We'll see how inspiring it is. I did a half ironman last year and am planning on doing another next year, with the goal of doing a full in Panama City, FL in 2013! Does sound crazy huh?